Mystery meat of such poor quality that it was rejected by McDonalds and Burger King is being purchased for school children to eat. What evil trolls would want to possibly harm our defenseless children? WHY, THE VERY USDA THAT IS SUPPOSED TO PROTECT US FROM UNSAFE FOODS! 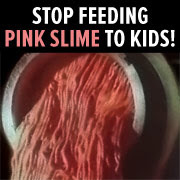 Hey Mrs. Obama--is ammonia-treated mystery meat part of your healthier eating campaign? Could you please remind your husband that the health of our children is more important than the campaign contributions which he and/or Bush got/gets from the pink slime manufacturers? Last time I checked, he was in charge of the USDA so clearly this is ok with him. But not with anyone who learns of it. And we've learn by now that Obama favors the people over corporations only when we demand something. So c'mon, folks!! Speak up! This is disgusting! If this crap is OK, then let's see them serve it to the Obama kids!